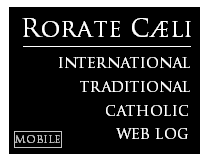 RORATE CÆLI: Joseph Ratzinger: "Criticism of papal pronouncements will be possible and even necessary, to the extent that they lack support in Scripture and the Creed"
Joseph Ratzinger: "Criticism of papal pronouncements will be possible and even necessary, to the extent that they lack support in Scripture and the Creed"
"One should especially avoid the impression that the pope (or the office in general) can only gather and express from time to time the statistical average of the living faith, for which a decision is not possible contrary to these average statistical values (which, besides, are problematic in their verifiability). The faith is based on the objective data of Scripture and of dogma, which in dark times can also frighteningly disappear from the consciousness of the greater part of Christianity (statistically), without losing in any way, however, their obligatory and binding character. In this case, the word of the pope can and should certainly go against statistics and against the power of an opinion, which strongly pretends to be the only valid one; and this will have to be done as decisively as the testimony of tradition is clear (like in the given case). On the contrary, criticism of papal pronouncements will be possible and even necessary, to the extent that they lack support in Scripture and the Creed, that is, in the faith of the whole Church. When neither the consensus of the whole Church is had, nor clear evidence from the sources is available, an ultimate binding decision is not possible. Were one formally to take place, the conditions for such an act would be lacking, and hence the question would have to be raised concerning its legitimacy." Fede, ragione, verità e amore, (Lindau 2009), p. 400. 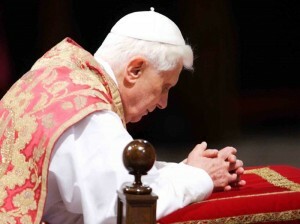 Ratzinger continued his reflections on the limits of the power of the Roman Pontiff to contradict immutable doctrine as Prefect of the Congregation for the Doctrine of the Faith and later as Pope Benedict XVI. 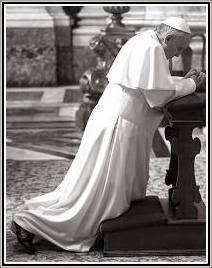 "The Roman Pontiff - like all the faithful - is subject to the Word of God, to the Catholic faith, and is the guarantor of the Church's obedience; in this sense he is servus servorum Dei. He does not make arbitrary decisions, but is spokesman for the will of the Lord, who speaks to man in the Scriptures lived and interpreted by Tradition; in other words, the episkope of the primacy has limits set by divine law and by the Church's divine, inviolable constitution found in Revelation. The Successor of Peter is the rock which guarantees a rigorous fidelity to the Word of God against arbitrariness and conformism: hence the martyrological nature of his primacy." "The power that Christ conferred upon Peter and his Successors is, in an absolute sense, a mandate to serve. The power of teaching in the Church involves a commitment to the service of obedience to the faith. The Pope is not an absolute monarch whose thoughts and desires are law. On the contrary: the Pope's ministry is a guarantee of obedience to Christ and to his Word. He must not proclaim his own ideas, but rather constantly bind himself and the Church to obedience to God's Word, in the face of every attempt to adapt it or water it down, and every form of opportunism."